Aside from car launches and the second week of pre-season testing, the Spanish Grand Prix represents one of the biggest tech fests in Formula 1. With the start of the European leg of the season commencing the teams are no longer bound by hefty freight costs when introducing large scale upgrades, and the bits that needed just a bit longer to perfect in the wind tunnel, dynos or workshops are now ready. The teams and drivers know the track extremely well, which is why the true pecking order is so often revealed in qualifying on Saturday. While every team will have new bits and pieces of some sort, Ferrari and Red Bull have both brought eye-catching updates that should help tighten up the lead battle, while McLaren have also caused a bit of a stir with their latest alterations. McLaren’s big upgrade for Spain has been the hot topic for tech talk in the run up to the weekend, and they made us wait for it on Thursday by wheeling out the car for scrutineering very late in the day. There are several changes to the MCL33’s aerodynamic package across the car, including a series of flap elements above the central section of the diffuser and updated sidepod baffles that were only brought to the car just over a month ago in Bahrain. The centrepiece of the upgrade, however, is the extravagant new nose design, which encompasses a number of design philosophies from other cars in addition to their own features that truly set it apart from anything else on the grid. The engineering behind the design is remarkable, as not only do the ideas behind the geometry seem inconceivable but the manufacturing challenges involved must have been a headache for the composites department, which is probably the main reason for its delayed debut. Firstly, the underlying features of the nose draw inspiration from Mercedes: a caped underside, pinched in at the front bulkhead and the camera pods protruding forwards from slender stalks are all copied over. These are integrated into a complex trio of apertures at the front, which combines Red Bull’s open ‘thumb’ tip and Sauber’s nostril design. The tunnels appear to form one common exit underneath the cape, although we are yet to see images of the back of it for confirmation – a lot of performance can be gained from increasing the volume flow rate ahead of the floor’s leading edge. Since the somewhat controversial noses of 2014 the rules state that when the nose is sliced and viewed from the side there must be only one single cross section throughout, meaning that gaps within the structure shouldn’t be possible. There are a few ways of getting around this rule depending on what you want to do with the airflow: Force India taper their openings to a thin slot at the back of the nose, while Red Bull have a series of vertical fins in the nose tip which overlap slightly. 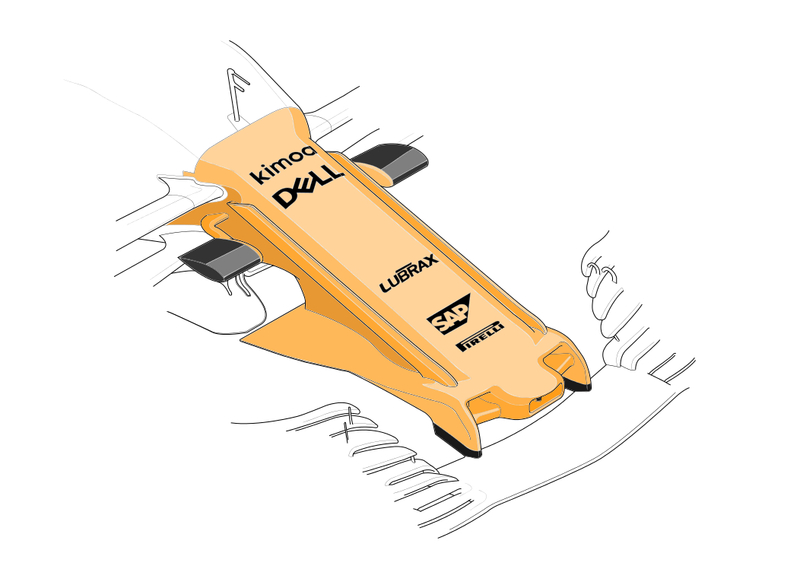 To circumnavigate this rule it appears as if McLaren have installed each of the three openings with one vertical piece, with the two in the outer channels curving inwards to overlap with the one in the centre. A unique part of the new nose is two thin bars of bodywork that run up the sides, integrated into the flared snout and braced at the top near the camera pods. These look like they control the airflow – which tends to sweep rapidly downwards in this area, driven by a low pressure zone behind – as it spills around the heavily filleted edges. Despite the presence of a small inlet at the bottom of the front bulkhead McLaren have not opted to integrate an S-duct into the car as yet, although there is still an opportunity to do so. 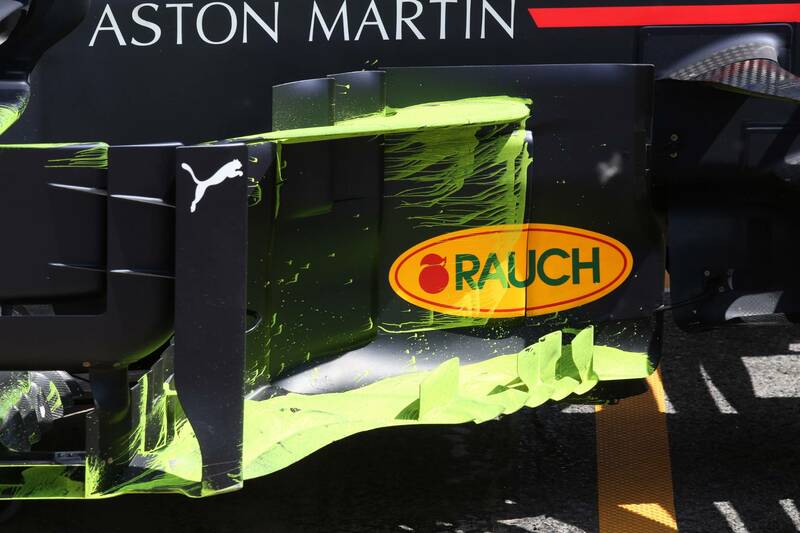 Immediately behind the trailing edge of the new cape are a pair of revised turning vanes that hang from the underside of the chassis, which help to control and enhance the flow structures shed from the cape ahead of the bargeboard area. Before McLaren stole the tech headlines Ferrari caused a few rumblings on Thursday when a few photographers spotted their new mirror housing design, or rather the housing mounts. 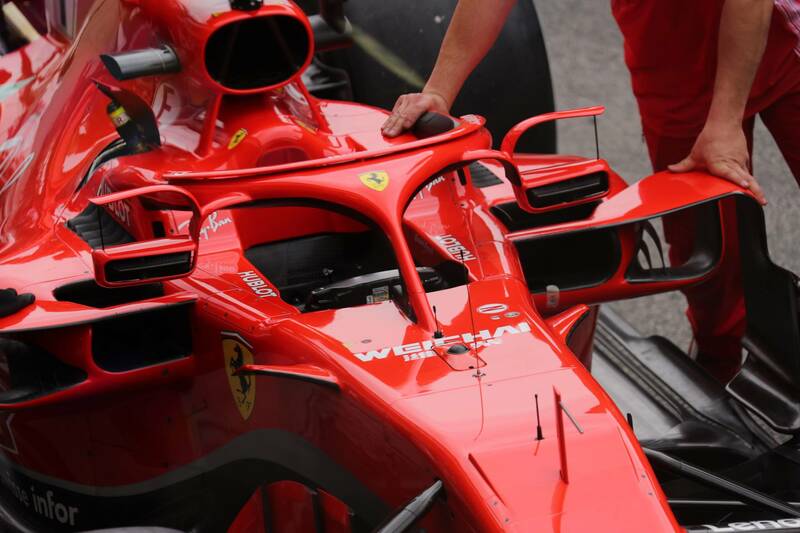 Just ahead of Baku the FIA gave the green light for Halo-mounted wing mirrors and the Scuderia have either hastily designed a rather interesting take on the ruling or knew in advance that the door would be opened but it’s set to be slammed shut again as the FIA bans the device from after the Spanish Grand Prix. The mirror housings themselves have been slightly edited but still feature the shell design with an opening at the front to allow air to pass through and around the mirror inside, creating a jet that controls the wake behind. The housings are bonded to the Halo fairing via curved brackets, which has been the FIA rule-makers biggest concern, upon which are these ‘eyebrow’ vanes that are braced to the housing with a vertical strut. Managing the air around the Halo has been one of 2018’s key design areas, and these vanes help push airflow back down along the top of the sidepod rather than swirling around airbox. Questions about their legality were circling on Thursday and it’s since been confirmed the mirror design will be banned after this weekend. While there is no written rule about the mirror housing and their mounts being used for aerodynamic purposes (which they have been for many years now), it’s been seen that Ferrari’s approach is a step too far. Changes are also evident on the SF71H’s floor: at the back the diffuser central section has again been altered, coinciding with the addition of a pair of longitudinal slots running along each side of the floor by the sidepods. The slots resemble those on this year’s McLaren, which are also divided midway along by a small strake. Their lipped leading edges invite the airflow passing along the floor to duck briefly underneath, tossed back out by the pressure difference between the upper and lower surfaces and forming a vortex ahead of the rear tyre to improve the performance of the diffuser. Without fundamentally changing anything to the car Red Bull have brought a sizeable upgrade package to Barcelona. The bargeboard area has received the most attention, with a series of serrations now made into the upper edge of each segment and a long slot carved into the largest board through the Rauch sponsorship logo. Creating a number of smaller sections is a tactic Mercedes have used for a few seasons now, energising the airflow and controlling how it leaves the bargeboards. Other amendments have been made to the footplate: more fluting and additional miniature vanes are there to micro-manage airflow in yaw conditions when the air requires more aggressive turning for the downstream features to function properly. Behind the bargeboards the leading edge of the floor has been further pronounced and no more than five teeth-like vanes are presented to the air that passes through. This is a key area of low pressure formed by the airflow diving under the car and into a venture; the teeth are in place to control the flow and ensure that the accelerated air is put to good use further downstream.